Everyone starts the year with a few goals and I’m no different, but 2015 was a massive year for myself covering the Australian International Air Show at Avalon, FCI Course, Exercise Talisman Sabre, Exercise Northern Shield , Exercise High Sierra and Warbirds Downunder. So for me 2016 had to be a smaller year with more of a focus on the aircraft that only have a few years left to fly. The ASO team has grown and the pressure was off to be everywhere around the country, and with our 3rd child on the way mid year, it was a very wise move to remember family always comes first. My plan was to cover Wings Over Illawarra, Mudgee Air Show, as much Classic Hornet action as possible, and make Exercise Pitch Black 2016 the big one. While there was also an ADF Airshow at Townsville, I was confident the rest of the team had that well covered. For the last 4 years I have been very lucky to have been able to capture the RAAF Roulettes on the scale that I have done, with a lot of behind the scenes access you can only dream of as a kid. The main person I have been working with has been SQNLDR Dan Kehoe who, when we first met, was flying as R2, in his second season. After having a seasons rest he came back to lead the team from up front as R1 Roulette leader. Over our time of knowing each other we both have the same passion to get today’s kids interested in Aviation in any way, shape or form. It’s not until you spend considerable hours with the team that you can really understand the time and effort that is involved with being a member of the RAAF Roulettes, remembering it is also their 2nd job, as their primary role is that of Flying Instructors. One of the key focus points we both had been looking at for some time, was how do you capture the PC-9 as part of the Roulettes before they get replaced by the new PC-21? We had both talked about the many awesome photos that had been taken in the past and agreed that from my perspective, I had always been looking up. While in an instant every childhood dream was just smashing my eyes with how insane it would be to go for a flight with the Roulettes , the better half of my mind thought I had already told my wife Holly, that I was home for the rest of the year. There are times in your life when you know you shouldn’t ask and should be very happy with what you already have, but sometimes you just have to ask and this was one of those times. Once Holly found out why, my smile was bigger than Luna Park and she just said the words I wanted to hear ” You have earned this chance so you have to go”. A month out, and my flying medical for “high performance aircraft” was done at RAAF Williamtown and while I was confident about passing, I was still very nervous about the whole event because if I failed for any reason, that would end any chance of flying in other, faster aircraft. I had passed the medical so now it was just a case of waiting and trying to visualize the photo’s I hope to capture. Once it was all confirmed it was actually happening I spoke with the NPS team at Nikon Australia, and it was decided that for such a rare chance to capture history, only the best would do. The brand new Nikon D5 DSLR and 24-120mm f.4 was the chosen setup with a Sandisk Extreme Pro 128gb card. When opportunities like this happen the last thing you need to go wrong, is for your gear to fail. The flight plan. Media pax ride. On the Thursday before the flight it was time to get fitted out with the fight suits and gear needed for the flight, but even at this stage I still reminded myself that at any moment this could all not happen. Trying to sleep the night before is something that just isn’t going to happen and before I knew it the big day was on. Meeting at the gate nice and early it was time to get this show on the road. Once inside the base it was a quick meet and greet with the Roulette team and then off to get changed into our flight gear. Everything at this level is done on a time line and no sooner than had we got changed, it was time for a walk around of the aircraft, followed by the preflight brief to give us a better idea of the action ahead. Something that is very clear to me is the detail the team goes into for each flight during their preflight brief. Nothing is left to chance at this level. Now the only thing left is to do the final checks and strap in. My pilot for the flight was FLT.LT Jonathan Morgan who has been in the team the whole time I have been working with the Roulettes, so it was great to be flying with someone I knew. Jonathan is in the pairs display along with FLT.LT Andrew Robinson, and together as the pairs team they perform their trademark formation known as “Mirror”. We had talked for many months about which photo’s were a high priority and we all agreed the “Mirror” was the number one shot we needed to get. To make sure we had the best chance, we measured out the wingspan and the degree of angle the lens would get, and then talked about all the things that could happen. It’s all about to get real. Once strapped in the canopy was shut and the engine started, from here it was just waiting for all the checks to be done then start taxiing out to the runway. Lining up to take off as a 3 ship, the moment was here, and feeling the brakes come off knowing it’s really happening it was something I would never forget. The dream from early childhood to fly with the Roulettes is REALLY happening! The thing was, I knew just how many people had made this flight happen so I just started smashing out as many photo’s as I could. Not a bad view to take in before it gets very real. PC-9 A23-058. You always have a clear plan of the photo’s you would like to get but once in the air the amount of awesome views just takes over. Straight away R4,R5 & R6 formed up and it became very clear just how close these guys actually fly together. Soon we caught up with R1,R2 & R3 and headed north to our practice area, flying in close formation the whole way. Since everything was going good Jonathan asked if I wanted to do a quick inverted flight just to check I was ok with it all, and with a quick reply of “Yes” he counted down and flipped the PC-9 over. I grabbed a few pics just to see how it would look and make sure I could control everything I needed to do. Thumbs up from FLTLT Andrew Robinson just after departing for the flight. PC-9 A23-025. Catching up with the rest of the team, R4 in front. PC-9 A23-067. The Roulette team meeting up to start the practice. Our first try at inverted flight to see how I handled it. Flipping back over we manoeuvered into some different formations and just cruised around the area we had available. All the time we were in the left outside position, so the whole flight I was looking out to my right taking photo’s. I didn’t really recall looking at the horizon, or anything inside the cockpit, as this was my biggest Roulette photographic opportunity, and I simply had to come back with some cracker photo’s. Due to Townsville airport being so close to the display area we had to wait for our time slot, but as luck would have it, something happened and we got pushed back. The team rolling into one of the many formation’s. Enjoying the roller coaster ride. Rolling back in again over the beautiful water north of Townsville. Everything was going good so it was time to try and get this inverted “Mirror” photo. We let the rest of the team move away and we started to manoeuvre the same way it’s performed in the public display. We moved around in an arc with Andrew below us on our left. Once Jonathan was in position he flipped us over inverted and then Andrew sped up to get into position directly below us. I was shooting non-stop but flying inverted, being so close to another plane ,is just something I really can’t describe, it’s just right there and while that’s full on, you are also inverted the whole time! I didn’t look anywhere apart from straight down and working the camera to get different settings. Yes it feels this close. We flipped back over and I quickly check the photo’s, you wouldn’t believe it but we were too close !!!! Jonathan asked how we went and I told him we needed more separation to which he laughed. The information was passed to Andrew and we lined up again, snap, the PC-9 flips over and it’s all on again. Andrew moves forward and lines up with us, I start taking photo’s and hope I get what is needed. Flipping back over I look at the photo’s but damn, I still didn’t get the whole aircraft in the shot! I again passed the information to Jonathan which he radioed to the team. R1 leader radioed back to see if I was keen for another go as time was running out, hell yes, let’s do this one last time. I knew I had to nail it this time. Roulette 6 coming around again before we flip over and he moves into position. Around we came again but I could tell Andrew was lower this time , we flipped over and he moved forward. Just as he got below us the light just went off. It was like someone had opened up the clouds to let the light highlight the aircraft and water below. We rolled back over and I looked at the back of the camera, straight away one frame just stood out and I called Jonathan to say we got it. Roulette 5 FLTLT Andrew Robinson in the “Mirror”. PC-9 A23-025. R4 nice and close. PC-9 A23-067. Looking forward to a cracker view. Looking down over the team with that amazing FNQ water below. We moved into formation with the rest of the team and got back into the various formations , since I knew I had gotten the photo we wanted, it was time to take in the moment. Darren Mottram who is in the ASO team and has had a few Macchi flight’s told me before the flight to take a moment to appreciate the hard work it takes to get a flight like this, and to just put the camera down and enjoy the flight. 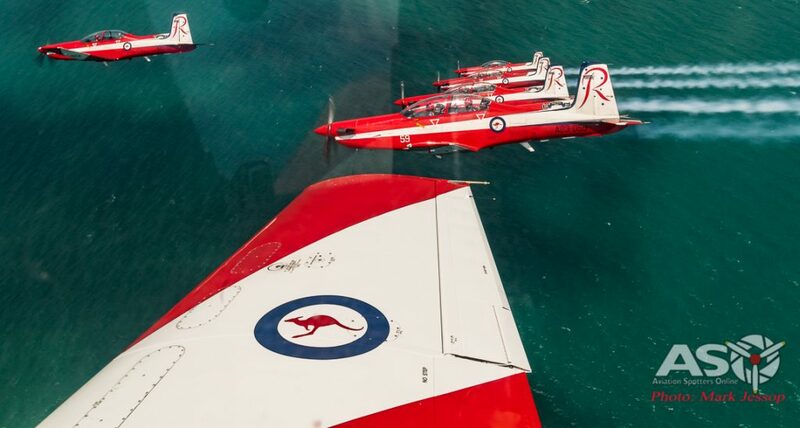 Here I was sitting in a PC-9 flying in formation with the RAAF Roulettes ! The next 10 minutes of the flight is something I will never forget. R1 radioed that we where clear to come back and have a quick practice over the Strand , by this time we had been flying for sometime so it wasn’t going to be a long display. Coming back into the Townsville area for a quick pass over the Strand. No better way to get into it then coming over the top. We moved into tight formation and banked over to start the “offset loop into tight turn”, gaining speed and energy the whole time and as we pulled up, I could feel the camera gaining weight. Once at the top of the loop it was back to normal but that was about to change. We descended down and boom, the camera gained weight from the G and was pushed into my gut. We came out of the turn and I knew it was time to grab the bag, a quick spit to get out some gas and all was good. I got straight back into taking photo’s but it was time up for our flight so we headed back to base. As we came into land I got one last chance to take in the view and appreciate what had actually just happened. Townsville and the “Strand” go flying past. Once out of the aircraft I was expecting the guys to get straight into giving me some grief for grabbing the bag but Andrew just walked up and said ” I could see you taking photo’s after grabbing the bag , AWESOME ! ” We all had the chance to have a quick chat and for me to say thank you but the team had to get some rest for their main practice later in the day. I also got the chance to thank Dan for making the flight happen at which time he told me this was one of his last flights in the Roulettes, and that he would have his final flight at RAAF Point Cook in a few weeks time. “Would you be able to make it?” Here we go again, time to ring Holly and tell her about how good the flight was while asking at the same time if I could go to Melbourne to capture the final Roulette flight of the year. Nice and low over for the locals to see. Job done. What an experience. Just a few weeks later I found myself at RAAF Point Cook to catch up with team and attend a special occasion. This time I was to capture the final flight of Dan’s time as a member of the RAAF Roulettes. And in doing so, ASO was privileged to get the last interview with SQNLDR Dan Kehoe – while he was Roulette Leader. SQNLDR Dan Kehoe giving the thumbs up. When did you 1st fly in the Roulettes ? I joined the team back in June 2013, going into the Roulette 2 position. It was really the culmination of 19 years of determination to get there, as I 1st saw the Roulettes as a young 14yo Air Force Cadet at the Kingaroy Airshow in the mid 90’s. I knew right then and there that I wanted to fly in the Roulettes one day. It just looked like great flying, great fun and something that I could strive to achieve in life. I now look back and am very grateful for never giving up on the dream, as it wasn’t the easiest path at times, but nothing worth having is, as they say. R1 about to get the show going. How many seasons have you done ? Without my logbook to check, I’d guess I flew around 120-150 displays with the team. I certainly never took any for granted though, even towards the end. As the leader I still prepared for each one as much as I could, which always culminated in me flying through the display referencing a printed off map, talking through every single manouevre and consideration with the whole team in the pre flight brief. I found it helped myself and the team fully focus on the job at hand. Funnily enough I was just as nervous before my last display as my first, which I think is healthy and a good sign that it still meant a lot to me! Have there been any personal favorite displays ? RAAF Roulettes pass over the water of Townsville. Have there been any personal favorite moments ? One does stand out, and it had nothing to do with flying actually! It was at the 2015 Avalon Airshow and I had just returned back to our aircraft when a ground crew member told me a young man was waiting at the fence to meet me. I went over to him to discover that I had spoken to him years earlier and had given him some advice and encouragement, and this had lead to him successfully being accepted into the RAAF as a pilot. That right there, is why I became a pilot in the Roulettes, to be able to inspire and motivate our next generation of young adults to reach for a goal. And to really re-pay the same inspiration that the Roulettes in Kingaroy had on me all those years ago! The fact he took the time out to say thanks re-affirmed to me that he’ll do well, and ended up leaving me pretty humbled just quietly. Leaders Dedication formation at RAAF Point Cook. Favorite move as a team ? I enjoyed the challenge of the ‘Cascade’ finish we sometimes flew where we all branch out after pointing straight down. It’s actually quite a hard manoeuvre to fly as the leader, as the point I have to fly to straight down has to be precisely on the correct heading after flying about 3/4 of a barrel roll, above a minimum height and all the while being very smooth for the wingman. It takes a lot of preparation and concentration to get spot on. How much practice is needed to stay current ? Once the team is certified for public display we have a minimum period of 2 weeks between displays. Any longer and we have to fly a practice in between. Although in between our display flying we are flying about twice a day with our regular flying instructor duties at the RAAF’s Central Flying School, so our skills are constantly maintained even when not Roulette’ing. R5 & R6 Mirror pass at RAAF Point Cook. Interactive talk with the crowd at RAAF Point Cook. Inspiring the next generation of pilot’s. Any closing thoughts on your time in the Roulettes ? I’ll be remaining at Central Flying School for another posting, taking up the position as the Chief Flying Instructor. I might get to do the odd Roulette solo display from time to time, just without 5 wingman hanging off me! RAAF Roulettes team photo 2016. Left Right – R1 SQNLDR Dan Kehoe , R2 FLTLT Charles Manning , R3 FLTLT Des Hales , R4 FLTLT Allister Berryman , R5 FLTLT Jonathan Morgan, R6 FLTLT Andrew Robinson & R7 FLTLT Ashley Kissock. Here is the final display for 2016 at RAAF Point Cook. Some awesome flying around Melbourne. After working with Dan for 4 years I can really say that my respect for what the team does, as well as what it means to each person within the team, is something I really hope my photo’s and the footage that we have captured, give the public a better insight to the Roulettes. Finally I would like to express my gratitude to have been part of recording just some of the Roulette’s long history, both on the ground and in the air, and wish the Team all the best for 2017 and beyond.